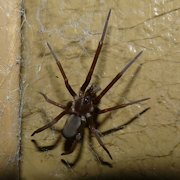 This female Southern House Spider (Kukulcania hibernalis) was recently found behind a picture in the Johns Island Schoolhouse Museum. True to her reclusive nature she was well hidden and and even ghostlike in appearance against the gray background. 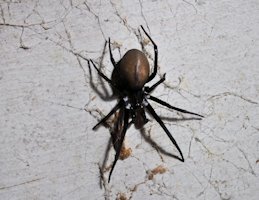 The male of the species has longer legs and a narrower abdomen. Both can grow up to 2 inches in length though our lady here was somewhat smaller; about an inch and a half. Distinct differences in appearance between genders is know as “sexual dimorphism” (which I’ll confess I had to look up). For more information see this excellent post at CarnivoraForum including some great photos. Johns Island is home to a wide variety of butterflys and colorful moths (as seen in our current banner photo). This is a Queen Butterfly (Danaus gilippus) on a Milkweed (Asclepias curassavica) bloom. 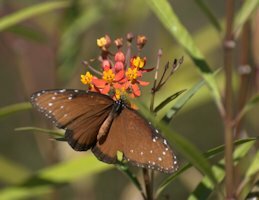 The Mexican or Tropical Milkweed is not native to the lowcountry but is frequently planted in gardens as an ornamental where this one was found. The Queen Butterfly feeds on the milkweed and uses it as a nursery for her eggs. In addition to it’s orange colored blossom, the milkweed plant’s attraction to butterflies is another reason it is so popular in gardens; a “twofer” of horticultural and entomological beauty. Thanks to Lori Porwoll for finding “Beast” and identifying spider, butterfly and plant. Where does the JI Conservancy stand on the building of the 526 extension? For it or against it? My wife, Laurie and I are new members of the JIC! The Johns Island Conservancy is neither for nor against the I526 extension. We have deliberately taken a neutral position. There are three main reasons for this. First, there are many other organizations that have been long involved with the issue and we feel are better able to represent it. The second, related reason is that our resources are limited and would get quickly sucked up in the controversy, and make no difference to whatever the eventual outcome will be. Thirdly, we believe there are other important issues that may not be getting the attention they deserve because of the overwhelming focus on I526.